Solid Snake's Actor MIA From MGS: Rising? Will Solid Snake once again sport the instantly-recognizable gruff grumble of David Hayter in Metal Gear Solid: Rising? If so, nobody's told Hayter yet. 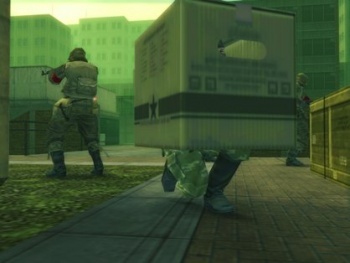 Since 1998's Metal Gear Solid, fans have come to expect certain things from the stealth-action franchise. For one, there will be lots and lots and lots of cutscenes filled with pretentious, vaguely-philosophical dialogue and narration. For another, guards will be horribly nearsighted and not very smart. And finally, the iconic voice of Solid Snake will be provided by David Hayter. Snake might not be the star of the upcoming Metal Gear Solid: Rising - that's severely messed-up cyborg ninja Raiden - but he's the face of the series, so there's no way Hideo Kojima would at least pass up a cameo, right? Which means that David Hayter will be tapped to voice him again, right? Right? Speaking with MTV Multiplayer, Hayter was asked about the two upcoming Metal Gear games. He praised the plot of Peace Walker, in which he provides the voice for Big Boss, calling it "a very in-depth telling of the Big Boss storyline." Of Rising, however, he didn't know much. "I don't know if I'm doing Metal Gear Rising," Hayter admitted. "Nobody's contacted me about it, so I have no idea." The game might be focusing on Raiden, but Solid Snake is the iconic character from the series - if he doesn't show up at all, fans are probably going to be slightly unhappy. Still, Hayter was quick to acknowledge that just because he hadn't heard anything, it doesn't mean that he wouldn't be involved with the game at all. "They usually call me once the Japanese game is done and they're starting to get into the English translation. So we're not completely done, but it's on its way by the time they get in touch with me." So hopefully, Hayter will cigarette-rasp his way through the voice of Solid Snake once again - just don't expect to hear it at E3. Hey, someone ask Quinton Flynn if they've gotten in touch with him yet, quickly!